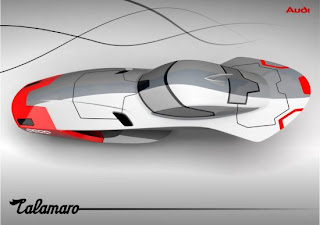 The Audi Calamaro Concept was developed by a designer Tibor for a design competition, organized by Porsche Hungary. 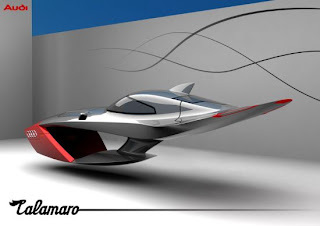 This futuristic flying concept car looks like a cross between a speed boat and a plane. According to the designer, the shape is inspired by “the bone of the cuttlefish”. We can’t see any propellers, tires or thrusters. We can only assume it will be powered by a new type of power source that hasn’t been developed yet. It is a very interesting concept, but in addition to the unknown futuristic engine it makes us ask how will it park or turn? Perhaps like the cars in Back To the Future sequel.